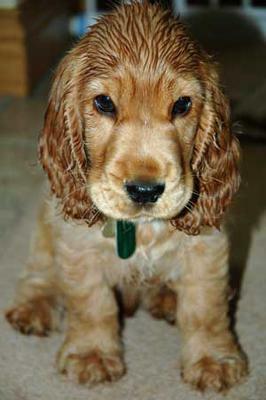 Like All Puppies - Cocker Spaniel Puppies Bite! Help! My cocker spaniel puppy is constantly biting and scratching me and I don't know what to do. He's scratched me several times with his sharp teeth and he's also biting my clothes - he's ruined several knitted tops of mine and my friends. I really don't know what I can do about this and it's becoming a real problem. I'm sorry to hear that you're having problems with your puppy but don't worry, puppy biting is a natural phase that all puppies go through. It can easily be addressed with some training, which should be done as soon as possible. Whenever your puppy bites you, yelp loudly. This is the same reaction that he would get from his Mother and siblings if he was playing too aggressively in the pack. Yelping will teach him that biting hurts you and when he understands that, he may become more gentle. So, when he bites you, yelp, remove your hand gently and stop playing with him. Don't pull your hand away sharply as this may only encourage him to hang on to it and 'play' more and you'll also get a nasty scratch from his teeth! Replace your hand with a rubber puppy toy that he can play with and bite on. If your puppy continues to bite you, yelp again but this time leave the room for a couple of minutes. This is to let your puppy know that biting is not acceptable and that when he does, all play stops and he's left on his own. He won't like that. When He's Good, Let Him Know It! Reinforce his good behavior - give him plenty of praise when he licks you, or plays gently. It's important that you and anyone who comes into contact with him must be do the same. You might also like to begin training your puppy to respond to the 'off' command. Once he has learned this, if he goes to bite you, you can firmly say 'off' and he will obey. To train your puppy to follow the 'off' command, hold a treat in your hand. Let him see the treat, then close your hand and say 'off'. If he doesn't try to get at the treat, open your hand and say 'take it' and then give him the treat. Repeat this regularly each day. Eventually, you should be able to keep the treat in your open hand without him touching it simply by using this command. You are teaching your puppy that 'off' means 'don't touch'. Do these exercises a few times each day until he has learned them. You might also like to enroll your puppy in obedience and socialization classes as this would help enormously. Comments for Why Is My Puppy Biting? Don't worry, all puppies bite when they're young - they just need to be taught that they're hurting you. Every time your puppy bites, shout loudly, but don't scare her. She'll probably stop biting but if she doesn't get up and walk away from her - just ignore her. Eventually she'll learn that you don't want her to bite and if she does she won't get any of your attention.